Home » Reviews » Hunter Burn Review – Will it Really Help You Lose Weight? Find out how this fat burner performs under the spotlight and whether it really does work with our Hunter Burn review. A new challenger has entered the building. Hunter Burn is a self-described premium fat burner which seems to place some serious emphasis on quality. Ingredients, packaging and benefits are all described as top of the market by Hunter. Let’s put it to the test. Hunter Burn is marketed toward the most ambitious individuals. Specifically, those who’re balancing a high-pressure job, a busy family and social life and a demanding fitness regime. To align themselves with this demographic, according to the manufacturers, Hunter Burn has been created using only the most high-grade, well-dosed natural ingredients. As a first impression, it certainly seems to be a luxury product. The packaging is sleek and clean cut, with an understated matte black bottle. 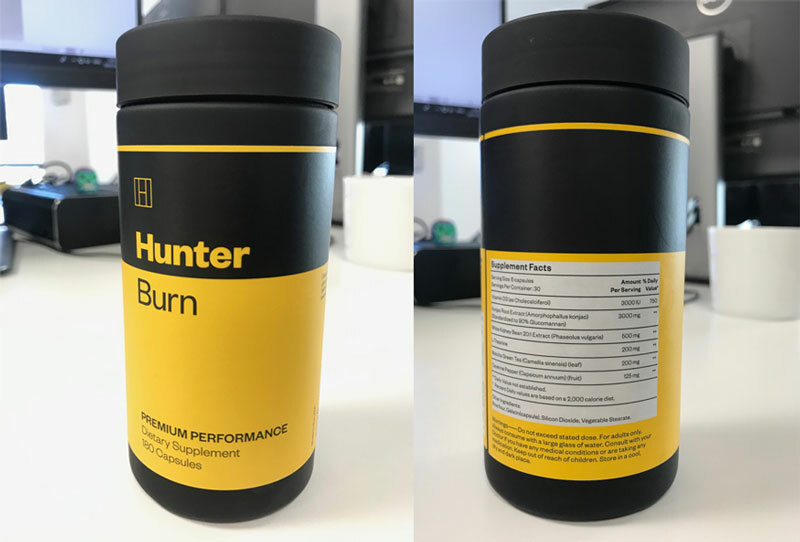 Hunter Burn definitely looks the part, and it’s quite clearly marketed towards men. However, we’re more interested about what’s in the capsules than the packaging it comes in and, at first glance, it looks like it could have the potential to help women. This supplement claims to provide a “premium performance” which will help you burn fat, without losing muscle. It should also make you feel and look better, beat hunger cravings and power you through a low-calorie diet. We’ve reviewed a lot of different supplements, but Hunter Burn really piles on the benefits. It seems like a lot of big promises, so we wanted to take a closer look at the supplement facts. More importantly, we want to know how they plan to achieve all this without one of the most common fat burner ingredients – caffeine. Hunter Burn might not have a completely conventional fat burner formula, but from first glance, it’s got some highly effective ingredients in the mix. Some of these are at the most generous dosages we’ve seen. Although this is quite obviously a product designed to appeal to men, we’re still excited to put this fat burner to the test on behalf of women. It contains a number of elements that will help females overcome the unique hurdles we experience when on a diet. To find out if it really delivers, we’ll thoroughly review each ingredient to assess how it contributes to the fat loss process. We’ll be looking for ingredients we’re familiar with, that are scientifically proven to work. It’s also a big priority of ours to find supplements that are safe to use. We’ll be assessing the Hunter Burn ingredients and dosages to ensure it offers a safe and side-effect free experience for our readers. To complete the Hunter Burn review, we’ll be comparing our results against the cost of the supplement to establish a value for money rating. At SpotMeGirl, we’re very familiar with the world of supplements and have collectively reviewed countless products. We’ll be using our knowledge of the industry and the expertise we’ve gained over the years to bring you an insight into whether or not Hunter Burn will help you lose weight. How much is Hunter Burn? Of course, as it should be, the main benefit of Hunter Burn is that it should help you lose fat, when paired with a calorie-restricted diet and a healthy lifestyle. However, this supplement is a little different – it delivers results through one of the most sophisticated diet support systems we’ve seen. As with any quality fat burner, Hunter has a selection of thermogenic ingredients, designed to raise your metabolism. This helps to boost the number of calories your body uses, even while you’re resting. One thing that puts an end to diets for so many women is cravings. Hormonally, we’re more inclined to crave sugary or fatty foods, which makes it so much harder to resist when you’re on a diet. Hunter Burn combats this by using powerful, natural appetite suppressants that are proven to work. This offers an extra pillar of support, in the form of a preventative measure. We’re only human and occasionally a cheat meal is necessary to keep you sane and satisfied while you’re on a calorie-controlled diet. To prepare your body for this situation, Hunter burn contains a natural carb blocker. This minimizes the fat storing effects you may experience after enjoying a cheat meal. As well as bolstering your willpower and helping to reduce the consequences of cheat meals, Hunter Burn helps you maintain your active lifestyle by providing an energy boost. Although we’re used to seeing this, we’re most familiar with it in the form of caffeine anhydrous. This supplement doesn’t actually contain any added stimulants. Instead you’ll find a clean lift in the generous portion of the potent matcha green tea extract. It’s slightly different to other fat burners, however research has revealed it’s everything you need for a powerful, yet side-effect free lift. The first place to look when establishing safety on a product is at the supplement facts label. We found that Hunter Burn boasts a completely natural ingredient profile, with just six ingredients. There are no undisclosed proprietary blends, and without caffeine anhydrous in the mix, it’s unlikely you’ll experience any side-effects or safety issues from this formula. We’d rate it as one of the safest options out there. Although no caffeine is added, there is still some within the matcha green tea. It’s only a small amount but be sure to factor the additional stimulant into your overall daily intake if you’re sensitive. Simply reduce the amount of coffee or tea you drink throughout the day, drink plenty of water and avoid taking your last capsules close to bed time. If there’s any chance you could be pregnant, we recommend you avoid taking a supplement before speaking to your doctor. 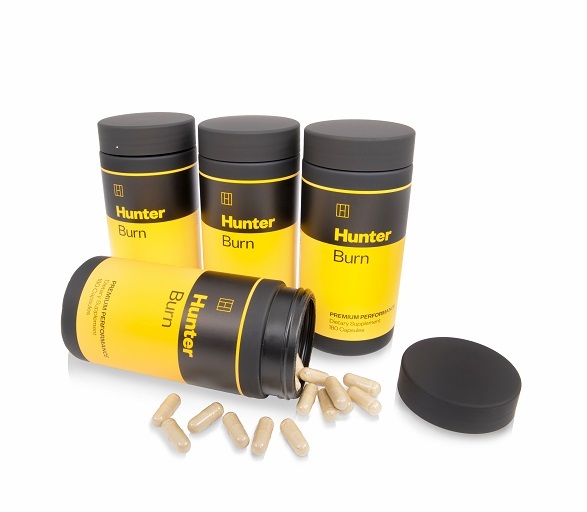 There are only six ingredients in the Hunter Burn formula, and each one is completely natural. After thorough research into the science behind them, we found they all have specific roles to support different stages of the fat loss process and maximize fat loss results. One of the most unique elements of Hunter Burn is that, because you take six capsules a day and because there are so few ingredients in the formula, each ingredient is very well dosed. In particular, the glucomannan is provided in a very generous portion, which improves the hunger combatting abilities of the formula. Clinically proven to help with weight loss, vitamin D3 is a powerful, yet unusual addition to a fat burner. We know it well from testosterone boosters, however in this mix it’s used to aid weight loss and to support muscle . If you’ve explored a few different fat burners, you’ll know that glucomannan in konjac root extract is a powerful appetite suppressant. Science shows that, by expanding when it’s in your stomach, it makes you feel fuller and helps to keep cravings under control . Hunter Burn have emphasized this ingredient in their mix, by offering one of the biggest servings we’ve seen. On top of that, they’ve standardized it to 90% glucomannan to provide a more concentrated variation of the supplement. After research, we found that white kidney bean is the only known natural carb blocker. That means, your body won’t metabolize complex carbohydrates into simple sugars, so it won’t be stored as fat within your body . This helps to stop you from gaining weight. White kidney bean is a very intelligent addition to the Hunter Burn formula. Where most good fat burners, provide a preventative measure with an appetite suppressant, this supplement has that, and damage control too. We know a lot about L-theanine, however it’s usually present in pre-workouts and nootropics. To learn more about why it’s in Hunter, we had to change our perspective a little. After research we can say it very much deserves its place in the fat burner formula. The calm alertness we’re used to from L-theanine has been found to stop comfort eating, adding to the appetite suppressant effect. It’s also been linked to lower levels of fat cells in your body . Green tea is one of the biggest hitters in natural fat burners. It’s high in catechins, which induces thermogenesis and raises your metabolism. Matcha green tea takes this to the next level, as we’ve found it to be three times stronger than other common strains . After looking around the market, we found that Hunter Burn is one of very few fat burners to contain this potent ingredient. We’re very familiar with the thermogenic qualities of cayenne pepper. Studies have shown that this supplement is directly linked to an increase in body temperature, which in turn raises your metabolism . With a generous portion of this in your fat burner, you’ll be burning more calories, even at rest. As this supplement is so carefully dosed, we recommend you follow the advice given by the manufacturers when it comes to taking Hunter Burn. The recommended amount is two capsules, three times a day, equaling six overall. Hunter Burn contains some powerful appetite suppressants, so we recommend you plan your intake around the times you usually eat. This way, you’re less likely to overindulge at meal times or give in to snacking. The key to success with this supplement is consistency. To keep thermogenesis working, you need to ensure you don’t miss a dose. We’d also recommend you avoid taking your last dose too close to your bedtime, as the caffeine within the green tea could affect the quality of your sleep. A single bottle of Hunter Burn provides 180 capsules, which is enough for 30 days of the supplement. The manufacturers of the product provide a deal which gives you an extra month of Hunter Burn when you buy three months. You’ll also benefit from free USA and UK delivery. This may help you save money if you decide to use Hunter Burn in the long term. Although it’s designed for men, all the ingredients within the Hunter Burn formula add up to a comprehensive diet support system for women. In short, it’s one of our favorite fat burners. The formula offers fat burning qualities, an impressive dose of appetite suppressants and even damage control carb blockers, which makes it ideal for the dieting woman. On top of that, it’ll also energize you to head to the gym and support an active lifestyle. Hunter Burn is completely safe, side-effect free and, when accompanied by a calorie restricted diet and an active lifestyle, it has what it takes to give your weight loss attempts an edge. One issue with Hunter Burn is the price. It’s one of the most expensive supplements out there, which might not make it accessible for everyone. Having said that, if you can afford it then you’ll struggle to find a better stimulant free fat burner. Overall, as an appropriate and effective fat burner for women, Hunter Burn ticks all the boxes. When paired with the right lifestyle, we think it will provide noticeable support and enhance your diet results. Find out how Hunter Burn stacks up against other fat burners. Check out our review of the best fat burner supplements right here. Pilz, S. et al. Effect of vitamin D supplementation on testosterone levels in men. Horm Metab Res. 2011 Mar;43(3):223-5. Ods.od.nih.gov. (2018). Office of Dietary Supplements – Dietary Supplements for Weight Loss. Barrett, M.L. and Udani, J.K. A proprietary alpha-amylase inhibitor from white bean (Phaseolus vulgaris): A review of clinical studies on weight loss and glycemic control. Nutr J. 2011; 10: 24. Published online 2011 Mar 17. Zheng, G. et al. Anti-obesity effects of three major components of green tea, catechins, caffeine and theanine, in mice. In Vivo. 2004 Jan-Feb;18(1):55-62. Weiss, D.J. and Anterton, C.R. Determination of catechins in matcha green tea by micellar electrokinetic chromatography. J Chromatogr A. 2003 Sep 5;1011(1-2):173-80. Janssens, P.L. et al. Acute effects of capsaicin on energy expenditure and fat oxidation in negative energy balance. PLoS One. 2013 Jul 2;8(7):e67786.